This week the challenge was to make something for someone in our community. 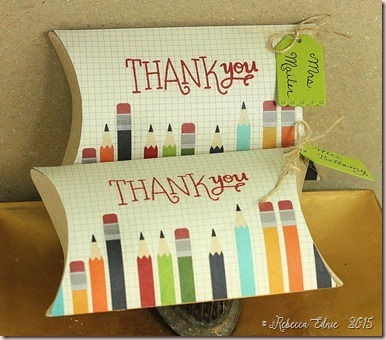 I decided to get a couple of gift certificates for my children’s teachers and decorate the packaging. 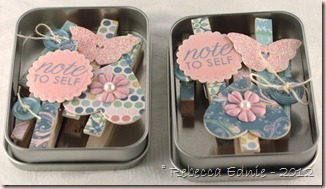 I used a gift box die and a couple of tag dies. Overall this is very simple but since I’ve had strep for the last week, it was all I could muster up. 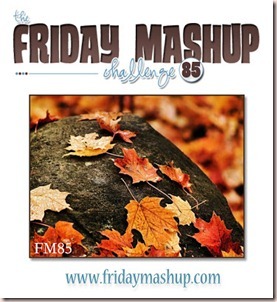 I hope you play along with Jennifer’s challenges too. Hello and I’m glad you are joining me for another week at The Shabby Tea Room! 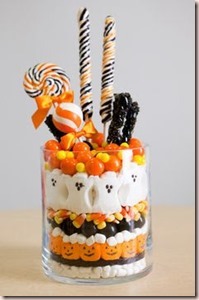 This week, we had a yummy inspiration photo. I don’t celebrate Halloween so I made some fall decor instead. I plan to put coffee beans and a faux tea light in there. I took the colours from the photo and decided to use the black plus white and one other colour scheme. I just substituted ivory for the white and dark red for the yellow/orange combo. The cute little treat box is from The Cutting Cafe who is our sponsor this week. It was a breeze to print out and construct; I highly recommend you check them out! So, I kinda wish I could have a do over on the glass glitter I added to the burgundy roses. I was a bit too much for such small flowers and while I scraped a lot of excess away, I still regret it. But it wasn’t bad enough to bother wasting the flowers and starting again especially since I attached them with E6000 glue! It’s a fabulous glue for bulky 3-D items but no way are those coming off with out major tearing. I do hope you will play with us this week! We have fabulous prizes for the top winners. Be sure to visit the blog to see the FABULOUS creations by our awesomely talented designers and leave em some love! 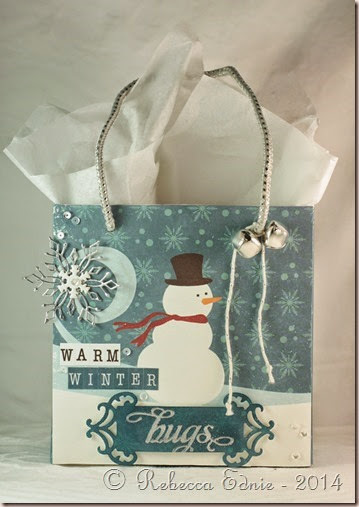 This is for the Wrap It Up Warm challenge to make a gift bag or box with a cozy feel. I hope the ‘hugs’ sentiment is sufficiently cozy. The base of the box/bag is a cracker box. I modified it since it was too big as is. I just cut it down so that it was less than 6” each dimension because I had originally meant to use 6×6” paper on it. But as it turned out, I used 12×12” paper and ended up using less (ok, only a smidge less) than a full sheet to cover the entire thing! Yeah! I even cut the fancy tag shape from the remaining paper! I added ink to it to darken it and make the silver EP stand out. I used the silver EP on the snowflake too. I hope you have fun visiting other stops linked to the PJ party! Ink: Versamark, night of navy-SU! Accessories: marshmallow and clear sequins-Pretty Pink Posh, tag fie-Spellbinders, foam dots-The Sticky Stuff Store, bells-Michaels, twine-?, stickers-Echo Park, Lindeman snowflake die-Memory Box, snowflake brad-?, silver EP-SU! My third and final (out of time, I had more ideas) entry into the CASE Study DT challenge. My personal muse is definitely Melissa Phillips so here’s another CASE of a tag she made. Here’s a link to Melissa’s tag. I kept the tag, scalloped bottom though mine is made of paper strips not strips of washi tape, felt flowers, polka dots and single large embossed work across the top. I changed up the colours and added longer lace and ribbons at the top styled differently with a button tie. I also added a reinforcer circle made from DP, a cardstock lace edge, and quite a few super tiny rhinestones. I really like this one. It’s so happy and springy and works for any situation. I mean, seriously, who CAN’T use a hug when you give them a gift?? Please choose me for the DT. I work hard, am punctual and love working from inspiration challenges. This is my second entry for the CASE Study DT. I sooo want to be chosen. I save so many cards on Pinterest and CASE them so this DT would be perfect for me! 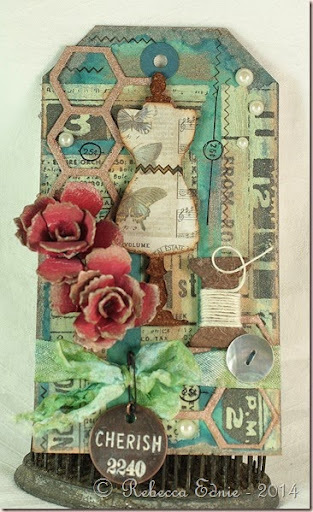 I CASEd the April tag by Tim Holtz. Of course I plan to link this up to that challenge too. I used almost the same technique for the background with the exception of using distress stain instead of distress paint. 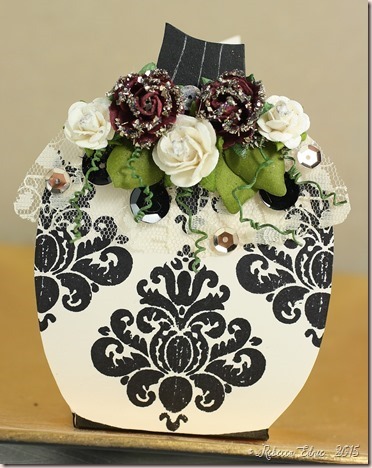 I added some more embellishments, made my flowers differently and added some stitch stamping. I also added some lovely shimmer with bronze distress stain. I hope you like it. I know I would be an excellent team member. I am currently on the Unscripted Sketches DT and I haven’t missed a week since November. I hope I am chosen. Pretty please! I’m a bit bummed about the photo of the wreath on this tag; it’s so pretty IRL and so hard to see in the photo! I would have made the crocheted strand much longer so the final wreath would be thicker but I ran out of time. Maybe if the background was solid it may have stood out better, in fact I’m pretty sure it would have, my bad. It’s actually really easy to make, you thread your beads on thin wire, 26 gauge or thinner. Keep your wire on the spool, don’t pre-cut it. Then just start chain crocheting it. Every so many stitches, you have to decide what look you want (one bead every stitch, every second, third…), you slide a bead along and stitch it in. Easy Peasy! I wrapped mine twice but I think I should have wrapped it at least 4 times to make it more dense and stand out from the background more. For the background, I used Sharon Harnist’s double embossing technique. You can find her tutorial at the Classroom as part of the 12 tags of Christmas. 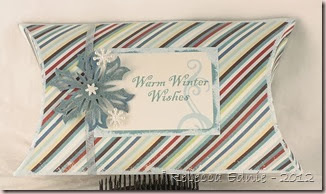 I started by using glitter embossing powder but I overheated it so I embossed over it with clear embossing powder. Then I used two blues, one was more turquoise-ish, and E77 to airbrush the background. Removing the colour from the embossing was the fun part; it is quite dramatic! 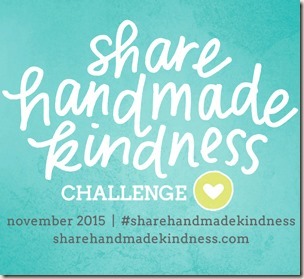 I’m also going to enter this in the Really Reasonable Ribbon Challenge 62 to create anything! Paper: white CS-PTI, chocolate CS-SU! I decided I am going to make an effort to make items other than cards for my Unscripted Sketches design team projects. I was looking through my alterables and the first thing I found was this pillow box. I ordered a few of these as possibilities for my sister’s wedding but they were way, way too big. I find it hard to judge sizes unless something is in front of me. Anyway, I swiped the edges with Versamark then added a mix of white and blue embossing powder and white glitter to the pillow and label. 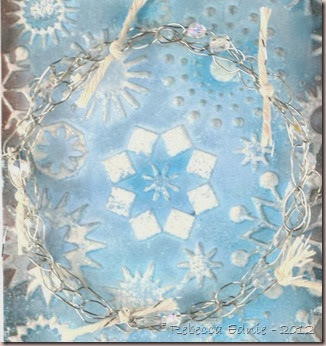 The blue snowflake has heat n stick powder and white glitter on it. I do hope you will join us at Unscripted Sketches this week. You at least want to visit to see all the awesome projects made by the design team! They are really awesome this week (I think I am going to find myself saying that EVERY week; these girls are talented!) You can make any type of project you like; we welcome things other than cards like scrapbook pages, packaging, notebooks or journals, home dec like configurations, frames, wall art or boxes, sewing projects, mixed media, even ornaments! Or anything else you can think of! Yep, you read that correctly! 2011! I had a spa party for some of my girlfriends and I forgot to blog it! Crazy! I bought some of the stuff I needed and made others. Here are the things I made. Do you have any idea how long and hard I Had to look to find this You’re Invited stamp? OMW! I thought I was going to go crazy looking for it! Aren’t these cute? I didn’t have that many people so I tailored the designs to suit each person. Yep, two sets using these older papers. Nice for almost anyone. For a couple people whose favourite colours I didn’t know. These two were my favourites. 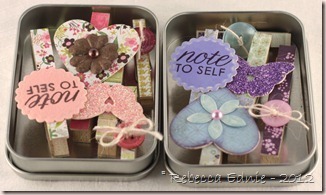 The outside of the tins were decorated with embossed vellum and a die cut topped by a medallion. 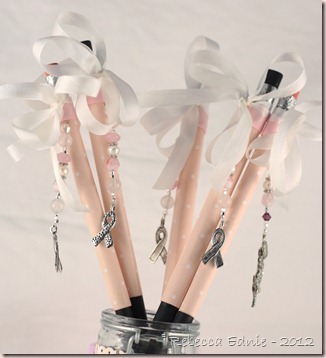 Everyone got a pretty beaded pencil too. Also in the bags were a mini lip gloss, a mani kit, a bath scrubbie, a hair band and a bracelet beading kit. I think there were a couple other things too but it was such a long time ago! 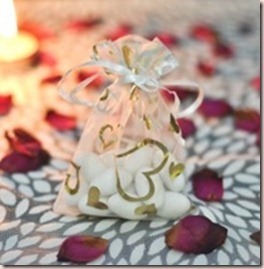 I wish I had a picture of how I decorated the bags too! We made the bracelet, did our nails and some of us put on a clay face mask while we watched movies. We ate all manner of goodies as I set up a candy bar, made an enchilada dinner and had cupcakes not only for dessert but also all afternoon. If you are really on the ball you will have figured out that I did all of this while 6 months pregnant! It would take ages to write a recipe for this so if you have any questions, fee free to email me or leave a comment with your email. This challenge was to be inspired by Pinterest and make some sort of packaging. Here’s my inspiration photo. Click on it to visit the source. 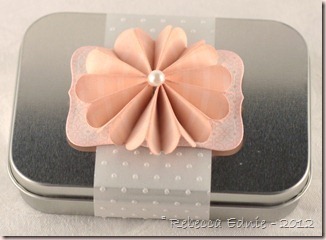 This sweet little pillow box will hold the jewellery I’m making for my sister’s flower girl. The jewellery is gold with cream and gold pearls so I thought this was perfect! The hearts were embossed with golf powder. 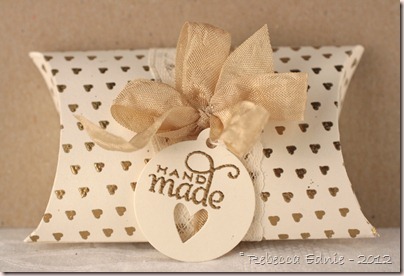 If I make this again with this background stamp, I’ll align the pattern with the edge of the pillow box. It’s so simple, I think this is all I need to say! I’m also entering this in the Simon Says Stamp challenge to use hearts. I found a few things in the Avon catalogue that I knew my girlfriend would like and were also on sale (yeah!) so when they arrived, I knew they needed some pretty packaging! The box uses a clear box I got stamps in from PTI. I added a cardstock bottom; makes for such a nice presentation I think. Quite professional I think. My button is also recycled, it still has the thread in it and even a scrap from the original garment on the back. I made the flower. It actually uses the Spellbinders rolled flower die. Doesn’t look like it does it? I’m going to be coming up with a tutorial on how I do that soon, stay tuned! The sentiment says, “A friend is someone who sings your heart’s sing back to you when you have forgotten the words.” –David Coppola. You can click the photo to enlarge it and get a clearer version too. 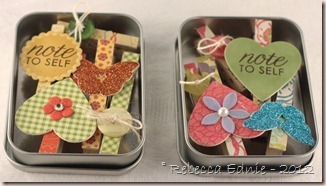 If you ever want to make a nice gift basket or gift box, consider varying the heights of items or raising them to make them more visible with glue dots. In baskets, professionals even glue things to skewers (with points removed) to raise small things up above the edges of the basket or container. I used them to hold the nail polish up.